This picture is likely to draw the ire of many NFL fans as Patriots Fatigue has become widespread. But most of the Patriots-hating has been a recent fad, when it fact it should have started a decade-and-a-half ago. Flashback to November 30, 2003. Do you remember where you were back then? Almost certainly not, unless you’ve got my uncanny encyclopedic memory. I was a freshman in college, glued to the TV on a Sunday afternoon. The big game that week was Tom Brady and the 9-2 Patriots visiting Peyton Manning and the 9-2 Colts. They weren’t even playing for the AFC’s best record, because the Chiefs were 10-1 at that point. It was a well-hyped game, but not in the way it is today because there weren’t 50,000 additional TV channels and Internet stories popping up on your smartphones. You had to be in the know to know. You can hear as clear as day someone from the Patriots yell out, “It’s a run right here!” And indeed it was. Much like Tony Romo and his brilliant forecasting in last Sunday’s AFC Championship Game, it was maddening to think that certain people knew what the Patriots were doing, but none of those people were the opponent’s head coach. Contrary to popular belief about the Tuck Rule spawning this Patriots’ reign of terror, do not be fooled — this play was just as instrumental. And I knew the ramifications instantly. Manning and I simultaneously put our hands up in frustration, both thinking along the same lines. For No. 18, it was a squandered opportunity to host the AFC Championship Game that year (the Colts would end up losing on the road and Manning would throw four picks). For this first-year college student, it was the realization and fear that an unstoppable force was upon us. Sure enough, the Patriots, who had come back late the previous week and wouldn’t trail in another game until the fourth quarter of Super Bowl XXXVIII, went on to win it all, and the wheels of a dynasty were in motion. I mention this not so much to give a history lesson (although I do enjoy hitting the rewind button on NFL lore), but to point out that so much of this nationwide “Patriot Fatigue” seems to be a new trend. And I can’t quite figure out why. Is it Brady jealousy? The fact that these days he’s married to Gisele Bundchen, as opposed to “merely” being with Bridget Moynahan? Because social media didn’t spring an abundance of Patriots-loving trolls on us? Because Bill Belichick’s sleeveless hoodies hadn’t started an anti-fashion trend yet? Or, perhaps the most obvious one — because Boston as a sports city wasn’t a monopoly yet? After all, back in 2003, the Red Sox were still in the midst of their so-called “curse,” and neither the Celtics nor Bruins had brought home championships in recent memory, either. People are obviously much more aware now than ever of New England’s accomplishments, and in fairness, that list has basically doubled since the Patriots’ third Super Bowl win in February 2005. Another element is Brady’s offensive prowess; his stats back in those early title runs were good, even borderline great, but not historic. When he set the touchdown pass record in 2007, the year the Patriots went 16-0, and earned his first MVP, I think people really started to consider him a true great as opposed to some kind of game manager. It is also easy to forget that between 2005-2013, the Patriots did not win a Super Bowl title, so anyone still feeling the sting of those first three may have been more at ease. But when Malcolm Butler jumped in front of Ricardo Lockette at the goal line to steal an interception (and if you watch that play a hundred times, it still looks like an optical illusion where the ball is caught by Lockette in one frame and then picked by Butler in the next), everything changed. Brady was a four-time champion now, freshly embroiled in Deflategate, no less. The Patriots and their fans — and it’s hard to distinguish how many of those were on board prior to Brady — started firing back at the “haters,” and also at commissioner Roger Goodell. The last two Super Bowls that the Patriots have won have also been in such improbable and heartbreaking fashion that the palpable sense of unfairness in the football universe that had already seemed so crystal-clear to me is starting to spread to the masses. As if the 10-point comeback culminated by the undrafted Butler’s heroic play wasn’t enough, erasing a 28-3 deficit at the expense of the Falcons — something that I believe even the 0-16 Browns wouldn’t have done more than once if you put them in that situation 100 times — made it impossible to ignore. The Julian Edelman circus catch, his last shining moment before an ACL tear and PED suspension kept him off the field until Week 5 of this season, wiped away any good feelings from the David Tyree and Mario Manningham miracle grabs in Super Bowls XLII and XLVI. 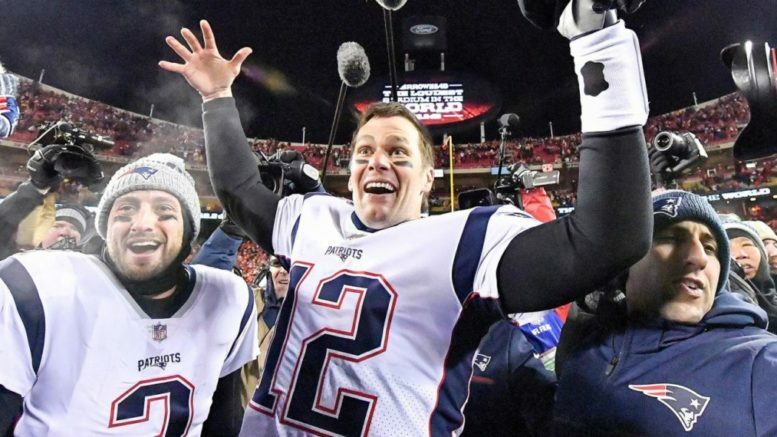 Last year certainly curbed some of the hatred, when Nick Foles gave Brady a dose of his own medicine in leading the Eagles to their first-ever Super Bowl win. But that lasted mere minutes until it was reported that Bundchen told her children, emotionally distraught at seeing their father lose, that “sometimes you have to let the other team win.” I for one have no problem with Bundchen’s parenting tactics there, but it undoubtedly rubbed many people the wrong way and only furthered the public notion that Patriots fans and their quarterback alike feel entitled to win every single year. And now, 2018. The year that was supposed to be the beginning of the end for the Patriots, and the beginning of the beginning for the disenchanted masses. But it wasn’t to be. The “Miami Miracle” skewed everyone’s perception that this wasn’t New England’s year, that a paltry 11-5 record was proof that the AFC wasn’t still theirs to lose. The grand irony is that the last time the Patriots lost more than four games in a season and actually had to play on wild card weekend was in 2009, a season that many chose to draw parallels to, yet represented a moment in time when Patriots hate wasn’t nearly as widespread. You could beg the question — or debate, as it were — as to whether this portion of the Pats’ dynasty is, in fact, more dynastic than the opening act. The early years were golden and featured more Super Bowl titles (for at least another 12 days, anyway) but also included that so-called decade-long lull that may have kept fans’ ire to a minimal level. Who could have predicted that all these years later, there would be so much disdain for the greatest quarterback-coach combination in professional football history? Well, besides me of course. Be the first to comment on "Are You Tired of the New England Patriots? You’re Only About 15 Years Late to the Party"